With the current state of the country one of division and turmoil, Rich Lerner and The Groove along with other local musicians and dedicated volunteers are hosting a day of music bringing the triad people together to support a local cause. The upcoming music festival Groove Jam V will feature many well-known local bands bringing rock and roll, blues, Americana, folk and acoustic music together to benefit Greensboro Urban Ministry. Greensboro Urban Ministry’s long, impressive history of helping people “dig out” of their crisis and “return to stability as quickly as possible” impressed Lerner and his team, who’ve seen many lives changed permanently through the efforts of this organization. “Greensboro Urban Ministry has been around for a long time offering consistent, effective resources to our local neighbors in need. They do more than just help in the moment. They provide the tools and resources to change the direction of people’s lives forever,” explains Lerner. As a Greensboro resident most of his life, Lerner started mulling over the idea of using music to give back some six years ago after speaking with Warren Haynes (Allman Brothers Band, The Dead, Gov’t Mule, etc) about his Asheville Christmas Jam benefiting the local Habitat for Humanity. Lerner, with decades of local and national musical connections, felt confident he could put something similar together on a smaller scale benefiting the triad area. So, in 2012 Groove Jam hosted its first music festival and attendance, band participation and enthusiasm have since exploded. 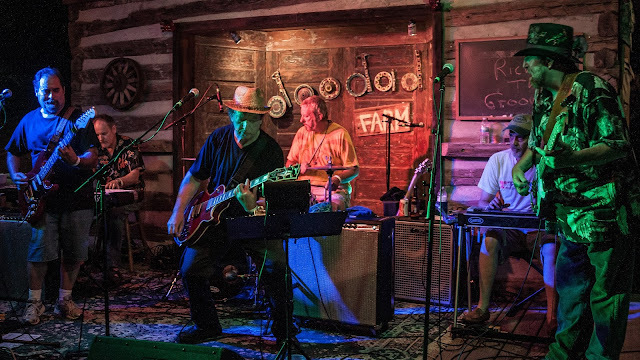 The Sept. 17th festival at Doodad Farm will feature live music starting at 1pm and will include performances by Rich Lerner and The Groove, Gooseberry Jam, the Mighty Fairlanes, Bump & Logie, Ladies Auxiliary, Sinai Mountain Ramblers, Midnight Sun, Peas n Karrots, CC3, and Benjy Johnson. There will be a variety of vendors, food trucks, and game activities on site. Coolers are welcome and there is plenty of room for camping. The admission is a suggested $10.00 donation and festival goers are asked to bring nonperishable food items for the local food bank. Lerner and his festival volunteers are hoping to beat last year’s donations of $10,000 and 1400 pounds of food. With more bands, more sponsors (including YES! Weekly and Buchanan Printing and Graphics) and more people attending, the team is confident this year’s donations will blow the roof off the 2015 totals. So consider this your personal invitation to be a part of something fun, enjoyable and charitable - something that’s bringing people together - Groove Jam V.
Doodad Farm is located at 4701 Land Rd just off McConnell Road exit from I 40/85. (Turn right on Hooting Holllow Road and turn right on Land Road) For more information or volunteer opportunities, call Rich Lerner (336) 314-3336 Website: groovejamgreensboro.com.